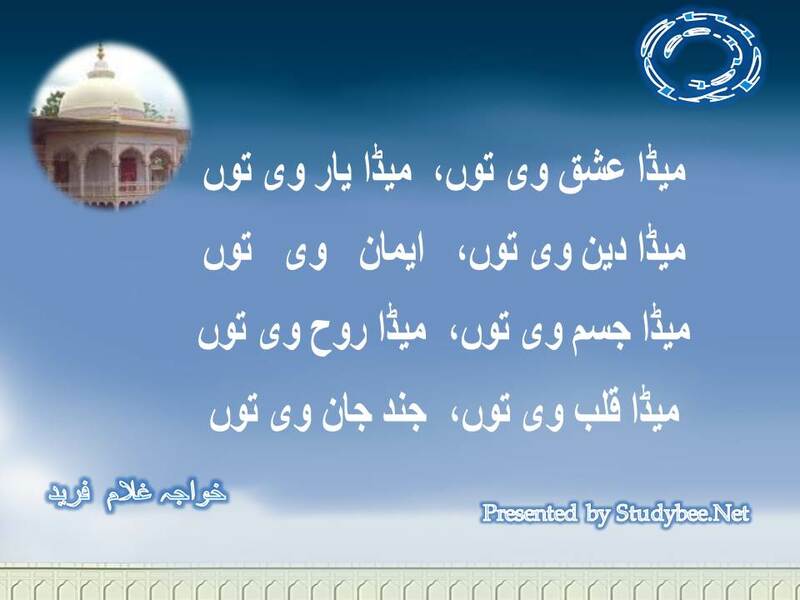 Meda Ishq Vi Tu Meda Yaar Vi Tu is a masterpiece on pure love by Khwaja Ghulam Farid often known as Baba Fareed. The poem is a long elaboration of the power of pure love that engulfs and wraps around the hearts of the true lovers. Khawaja Ghulam Farid offers himself bodily and spiritually to his love, God Almighty, in this poem meda ishq vi tu meda yaar vi tu. True love poetry begins and ends with the name and visualization of the beloved. Nothing would restrain the lover from the thoughts of the beloved. The poet tells us that he has wrapped up in the love of God Almighty to the extent that every place he goes and every thing he does is directly influenced by his pure love. Like other Punjabi and Sufi poetry, this arifana kalam, religious poetry, is cherished and rejoiced by several artists and celebrities alike.